Be careful not to hurt your hands when a fuse is replaced due to narrow space. 3. Pull the suspected fuse straight out. 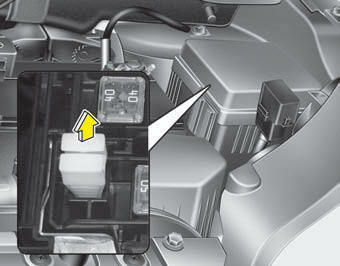 Use the fuse puller provided on the engine compartment fuse panel cover. 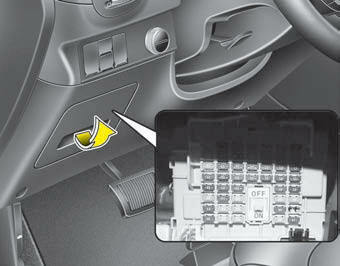 Spare fuses are provided in the engine compartment fuse panel. 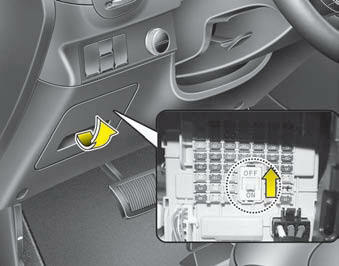 Always place the transportation fuse switch in the ON position while driving the vehicle. Do not move the transportation fuse switch repeatedly. The fuse switch may be worn out. If you need to park your vehicle for prolonged periods more than 1 month, move the transportation fuse switch to the OFF position to prevent the battery being discharged.